Pretzels are a snack food, which have unique shapes and a hard, shiny outer surface. They are mass produced using primarily automated machinery. First developed in the seventh century, pretzels have been called one of the world's oldest snack food. A recent market survey found that the pretzel market in the United States is about $560 million a year with over 300 million lb (136.2 million kg) of pretzels and pretzel products being produced. The pretzel market has grown in recent years because pretzels are considered a more healthy, fat-free snack. The unique, two looped, knot shape of a pretzel is one of its defining characteristics. The typical pretzel has a pleasant cracker-like flavor, a crisp, brittle texture and a brown glossy surface color. Salt crystals are often sprinkled on its surface to make them taste more appealing. Pretzels have a moisture content of anywhere from 2-4% and therefore have a very long shelf life. While the two-looped knot shaped, hard pretzels may be the most popular kind of pretzel, there are other kinds which are sold. Soft pretzels are also manufactured. These products typically have a much higher moisture content than hard pretzels and are usually larger. They also have a shorter shelf life. Other shapes are also produced such as thick and thin rods, pretzel rings, and loops. Additionally, flavored pretzel such as cheese, rye, caraway, kosher, and butter are also available. Finally, salt-free pretzels called baldies are now made. Some historians have said that the pretzel is the oldest snack food ever developed. It is believed that the pretzel was first developed during 610 A.D. by a monk in southern France or northern Italy. Using the dough left over from bread making, he formed the pretzel shape, which was meant to look like a child's arms folded in prayer. He used these creations as treats for children that learned their prayers. He called the snacks pretiola, which means little reward in Latin. The pretiolas eventually found their way into Germany and Austria where they became known as pretzels. The pretzels grew in popularity and are said to have been brought over to America on the Mayflower in 1620. The first pretzels were of the soft variety. Legend has it that one night a baker who was baking a batch of pretzels fell asleep. When he woke up all the moisture was cooked out of them and the hard pretzel was born. The primary ingredients in pretzel dough include flour, water, yeast, shortening, and sugar. Each of the ingredients have an important effect on the dough during manufacture and the properties of the final product. In pretzel dough making, flour is perhaps the most important ingredient. It is primarily made up of starch and protein. When water is added, the flour protein soaks up the water rapidly and reacts with it to form a mass known as gluten. The gluten can be stretched and formed quite a distance with-out breaking. This allows pretzels to be formed into the desired shapes. Sometimes the flour is enriched with various nutrients such as thiamin, riboflavin, and iron to increase the nutritional value of the product. Nutrient enrichment is highly regulated by the government so preset limits are required for a flour to be called enriched. The flour used for pretzels is called soft wheat flour and has a protein content of about 9%. It is the largest component in the dough making up about 65-70% of the total recipe. Pretzel dough is unusual in that it contains both yeast and chemical leavening agents. The yeast is put in the dough and it produces carbon dioxide gas as it metabolizes the sugar during fermentation. This gas creates tiny air pockets in the batter, which helps make the pretzels lighter and crispier. Yeast is typically supplied as a dry, granular product. Dry yeast is desirable because it can be stored for a long time at room temperature. Leavening agents have a similar effect as fermenting yeast, however they have less effect on the final taste. Chemical leavening agents include materials such as sodium bicarbonate and ammonium bicarbonate. In the presence of water, they breakdown chemically to produce carbon dioxide gas. Vegetable shortening is a solid form of vegetable fats and oils. Its main purpose in the dough is to inhibit the formation of the gluten. This helps the dough stay softer, increases the volume and gives it a crumbly texture. Fat also allows the dough to remain more palatable for longer. A typical pretzel recipe may call for about 2-3% vegetable shortening. The pretzel dough would not be possible without the use of water. While there is less water in pretzel dough than in bread dough, it still makes up about 30-35% of the recipe. Water is important because it lets the dough flow and allows the yeast to contact the sugars for fermentation. It also causes the chemical leavening agents to activate. The taste of the pretzel is a result of ingredients such as salt, sugar, and flavorings. Salt is used in the batter at about 1%. It helps to make the dough stronger in addition to improving the taste. Sugars such as sucrose or corn syrup are used for about 2% of the pretzel dough. The sugar has the primary effect of providing food for the yeast cells. Additionally, it will give a slightly sweet taste although this is very minimal in pretzel making. Sugar also contributes to the brown color of the pretzel. Today, the manufacture of pretzels is a nearly completely automated process, which converts the raw ingredients into a shaped, finished product. It is estimated that 90% of all pretzels are never touched by human hands during the manufacturing process. The following steps outline the procedure used to make typical hard pretzels. Soft pretzels have a slightly different manufacturing procedure. 1 The pretzel dough is made by factory compounders in large stainless steel tanks. The flour and warm water are stored in bulk and transferred to the tanks automatically. The yeast is added and the three ingredients are blended with high-speed horizontal mixers. When these are adequately blended, the rest of the ingredients such as sugar, sodium bicarbonate, vegetable shortening, salt and flavorings are added. Compared to many dough products such as bread or crackers, pretzel dough is relatively under mixed. This allows the dough to withstand the punishment of machining without becoming too sticky or misshapen. The dough is then allowed to ferment and rise for about 30 minutes. The dough is mixed in large vats by factory compounders. 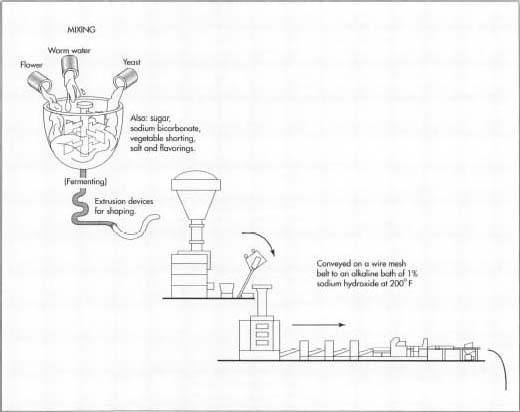 Once fermented, the dough is transferred to a hopper, which feeds the shape-making equipment. The raw pretzels are next conveyed on a wire mesh belt to an alkaline bath. the hopper while the stamped pretzels are transferred to a conveyor. They are passed under rollers to ensure a flat surface and uniformity of size. 3 The raw pretzels are next conveyed on a wire mesh belt to an alkaline bath. It generally takes several minutes for the pretzels to reach the bath. This slow transport is deliberate as it allows the pretzels to under-go another short fermentation or rest period. The alkaline bath is filled with an aqueous solution of either sodium carbonate or lye. The resulting bath has an overall 1% concentration of sodium hydroxide. It also is held at a temperature of about 200° F (93.3° C). The pretzels are dipped in the bath for 10-20 seconds and typically float when they are finished. This process gelatinizes the starch on the pretzel's surface making it gummy and sticky, allowing the salt to adhere more readily. After the pretzels leave the hot bath, they are passed under a machine which delivers salt crystals to their surface. Modern pretzelmaking lines use a vibrating salter, which consists of a vibrating plate driven by a series of small motors and magnets. 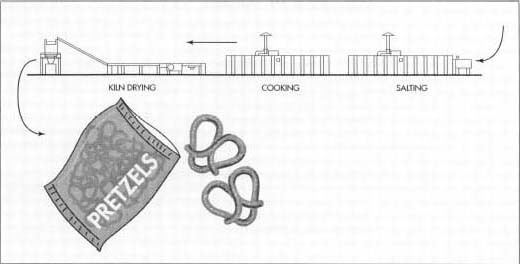 The salt is evenly distributed on each pretzel with the excess falling through the wire mesh belt and being recycled. Generally, the aim is to add about 2% salt to each pretzel. Raw pretzels are salted before being transported to long, gasfired, convection tunnel ovens. The cooking temperature varies from 350-550° F (176.7-286.1° C) and this baking step takes from about 4-8 minutes. Once baked, the pretzels are dried and packaged. tunnel ovens. The cooking temperature varies from 350-550° F (176.7-286.1° C) and this baking step takes from about 4-8 minutes. In the front of the oven, the temperature is significantly higher than at the end. The initial high heat caramelizes the gelatinized starch, which produces the characteristic dark brown pretzel color. The temperature is gradually raised at the start because if heated too fast, the structure of the pretzels will be weakened which could cause cracking and breaking during shipping. At the end of the oven the temperature is cooler to allow moisture in the pretzel to be released. During this entire baking cycle, the moisture content is reduced to about 15%. In the next baking phase, the pretzels are kiln dried or oven dried at about 250° F (119.4° C) for anywhere from 20-40 minutes. This further reduces the moisture content to below 4%. 5 From the ovens, the pretzels are passed along varies conveyors and allowed to cool. They are then moved along to the packaging machines. Here the pretzels are weighed and the correct amount is placed in the packaging. They can be put in many different types of packages including trays, boxes or bags with cellophane or polyethylene protected coatings. It is important that this packaging be air tight to prevent the uptake of moisture by the product. Excessive moisture would cause them to become soft. The package must also have consumer appealing graphics, which help it stand out on a store's shelves. Most major bakeries distribute products to all of the largest cities in the world. Consequently, there are very few people who are unfamiliar with pretzel snacks. To maintain a high degree of quality, pretzel manufacturers begin by thoroughly testing the raw ingredients. These materials are evaluated by quality control inspectors and subjected to a variety of tests. Various sensory characteristics such as odor, color, and flavor are evaluated. Other factors like the particle size of the flour, thickness of shortening, and pH of liquids are also examined. These tests ensure that the raw materials will produce a consistent batch of pretzels. On the final product, many of the same characteristics that were tested on the raw materials are evaluated. Chemists and technicians check things such as appearance, texture, flavor, and color. This will certify that each batch of pretzels shipped to stores will be of the same quality as those developed in the food laboratory. Future developments in pretzel manufacturing will likely be found in the production of new products and improved machines. Marketers will undoubtedly create new twists on existing products in an effort to make them taste better, appear more healthy, and more unique. Improvements in the automatic pretzel making machines will focus on designs, which increase the baking capacity and speed at which pretzels are made. Booth, Gordon, ed. Snack Food. New York: Van Nostrand Reinhold, 1990. Hoseney, Carl. Principles of Cereal Science and Technology. St. Paul: American Association of Cereal Chemists, 1994. Macrae, R., et al., ed. Encyclopedia of Food Science, Food Technology and Nutrition. San Diego: Academic Press, 1993. Russel, Margie. "Snackmakers Feel the CRUNCH." Food Engineering (May 1995): 86-93. Walter, Andreas. "Food Marketers Display the Future of Eating." SnackWorld (June 1997).